What is the merit? What is the sin? What is the reason for something become merit or sin? Those are not familiar with ordinary people. Because they learn merits and sins by some other person who told this is merit and this is sin. There are lot of arguments on merits and sins because of this unenlightenment. The persons knowing those very much are rare in even among Bhikkus. To understand merits and sins we have to analyze according to the matter and not just the word. The meritness and sinness of the Jawana Chitta (Look at the Lesson 10) is due to the mental factors join with those. Among the mental factors there are some factors that hurting the mind concatenation. Those are not calm. But there some factors that exulting the mind concatenation. Those are very calm and smooth. 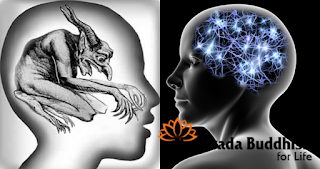 Greed, malice and delusion are the mental factors that hurt the mind concatenation. Devotion, Wisdom and Loving-Kindness are the mental factors that exulting the mind concatenation. Malice factor is very explicit. In hardly become malicious face blushing, body changes to sweating and trembling. Those are because of the hurt of malice factors. The Lust is a type of greed. Someone who has the lust highly, is ready to expend anything to slake it. Work hard for it. Sometimes doing very dangerous things. Never think the damages even life lost derive from those actions. He is doing those because he cannot bear the hurt which generates by the lust. Fools think this lust is divine. They describe it "divine love". Devotion, wisdom and loving-kindness makes someone's face more pleasant. His body becomes delightful. This will make the concatenation of Dhamma to delight. Healing diseases when heard Pirith Dhamma is due to the devotion generates on your mind and it will delight the body. Sin factor makes a good result. A good factor like devotion, wisdom and loving-kindness can make a good result and a bad factor like greed, malice, delusion only generates a bad result.